Kitchen tiles are more than just a way to cover a counter, a floor, or create a backsplash. Why think in terms of just covering up when you can have art work in your kitchen? Art that also serves a functional purpose. That’s where decorative kitchen tile comes in. There are basically four kinds of tile. Ceramic, Porcelain, marble and Glass. All can be used as wall covering, to cover your counter, and as floor covering, to name just a few kitchen tile ideas. When it comes to decorative tiles, you have options. One of these is handmade tile. These can be handmade from start to finish, by which I mean actually making molds and casting the clay, and then firing it in a kiln. There are crafting stores that can help you with this if you are interested. They have everything you need. The people working there will be more than happy to help you with any aspect you need assistance with. Actually, it’s kind of fun. Another possibility is handpainting tiles that have already been fired. 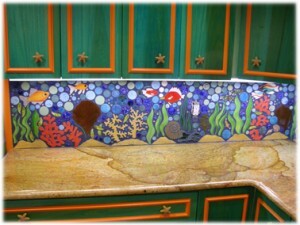 Release your inner artist and really express yourself by creating your own artistic decorative kitchen tiles. You can create the kitchen that is completely yours by this option. You can use small tiles of varying colors to create your own mosaic. The best way to do that is to have a drawing of your intended end result, and transfer it to the wall. Then just do small parts at a time, because you’ll have to cover parts of it with mastic before applying the tiles. These are just a few. There are many more. As you can see, there are many options. The only thing you really need is the desire to express yourself through artistic decorative kitchen tile.